The story of Vitra and the Danish designer and architect Verner Panton are inextricably linked. 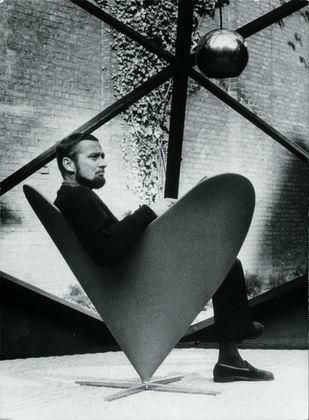 In the early 1960s Vitra invested to help Verner Panton realise his Panton Chair, an undertaking which was arguably one of the biggest challenges in Vitra's history, for all finding a suitable material and manufacturing process for a plastic cantilever chair - but after all, the Panton Chair was the first of its kind. Today, the legendary designer chair by Vitra is made from dyed polypropylene, in addition to a version known as a Panton Chair Classic in the original hard foam version. A version for children, the Panton Junior, joined the Panton Collection in 1999. Apart from the world-famous Panton Chair, numerous other furniture designs from the Panton Collection bear witness to Verner Panton's versatility: designs such as the Amoebe Highback armchair were part of futuristic room designs that Verner Panton realized, as in this case for the Visiona 2 in 1970 in Cologne. The Cushion Geometri or the Cone Chair from 1958, in turn, leave no doubt about Verner Panton's special fondness for textile designs, bold colours and geometric shapes.